A deluge of new laptops hit after Intel announced its next generation Core processors and Sony unveiled the spiritual successor of the Vaio Z (and P to some extent), the Vaio Pro, plus a new Vaio Duo. The Sony Vaio Pro comes in 13.3″ and 11.6″ versions, both targeting “lightest laptop with touch, ever” for their respective sizes, thanks to a carbon fiber build. The big one weighs 1,060g, while the small one tips the scale at just 871g. Both sizes of the Vaio Pro boast 1080p touchscreen displays with Sony’s Triluminous and X-Reality tech. For processor you can choose between fourth generation Intel Core i5 and i7 with 4GB or 8GB of RAM. The 13.3″ Sony Vaio Pro is the first to come with PCIe SSD, which Sony claims is faster than regular SSDs. This model comes with a full-size keyboard, the keyboard on both models is backlit. The palm rest is made of aluminum and is made to gradually “merge” with the desk for more comfortable typing. Also, both models can use a sheet battery to extend battery life to 14 hours for the 11.6″ Vaio Pro and 13 hours for the 13.3″ model. The Sony Vaio Duo 13 uses the same tablet slider hybrid design as the Duo 11 and is about the same size, while having a bigger screen and full-size keyboard with touchpad. Speaking of the screen, it’s a Triluminous, X-reality display again with 1080p resolution, scratch-resistant glass and support for a digitizer pen. The processor and RAM options are the same as on the Pros – Core i5 or i7, 4/8 GB of RAM. Thanks to the Active Sleep tech, the Vaio Duo 13 can download new email and other updates even when the device is asleep. There’s optional LTE connectivity. The Duo 13 is heavier than the Pros, weighing in at 1,329g. All three new devices run Windows 8 and use Sony’s ClearSound+ tech, include NFC connectivity and an Exmor R camera above the screen. The Duo 13 has an 8MP Exmor RS camera on the back too. All three new Vaio models will be available in late June. 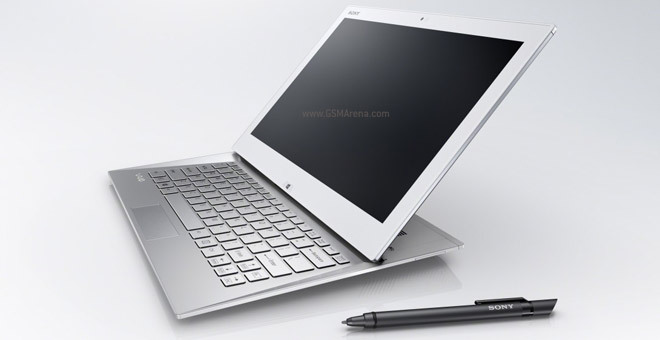 The Sony Vaio Pro 11.6″ starts at $1,150, the 13.3″ at $1,250 and the Vaio Duo 13 at $1,400.